Vaughn Bryant, Stanford ’94, MS from Northwestern in 2000, and National Football League Alumnus ’94-‘96, is presently the Chief Program Officer for the Chicago Park District. He is responsible for its largest department, Community Recreation. The Community Recreation Department focuses on the Park District’s core mission of providing high quality leisure services to Chicago residents and visitors. The department offers programs for citizens throughout the life course in athletics, aquatics, wellness, special events, cultural arts, and environmental education. Vaughn is a social entrepreneur with over 15 year of experience in both the public and private sectors. He has a proven track record of creating successful programs that meet market demand. He is recognized by his colleagues as an innovator and thought leader in education, social policy and program development. Vaughn previously worked for Chicago Public Schools, the National Football League and Stanford University. Sukeshi O’Neal is a lifelong learner and passionate advocate of education for all. She has put her Master of Nonprofit Administration from Notre Dame’s Mendoza’s College of Business to use as a founder, the CEO and Board Member of Bridge to College, Inc., which is a Non-Profit organization that focuses on assisting motivated at-risk Los Angeles high school students reach the goal of attending a four-year university. Sukeshi has assisted students in areas ranging from mentoring, providing tutors that specifically meet the requirements of each student’s individual needs, providing parent mentoring and guidance and supporting the application process. She has dedicated much of the last 10 years to looking for ways to better the lives of special needs individuals in the areas of schooling, living environment and medical and therapeutic assistance. Sukeshi’s various business interest range from affordable housing development to traveling museum exhibits and her tireless charitable outreach for several notable non-profit organizations keep her consistently engaged with the business community in Greater Los Angeles and throughout the state of California. Brittany Merritt is currently the Chicago Program Director for Peer Health Exchange. Brittany is responsible for leading the PHE program in Chicago by developing, managing, growing and evaluating the PHE Chicago Program, managing the PHE Chicago Program team and assisting with the development and execution of strategic plans. Prior to joining PHE, Brittany was a Senior Program & Event Coordinator in Community Recreation at the Chicago Park District. She was tasked with researching, planning, and leading the execution of community recreations new initiatives such as emerging program offerings and integrating youth program quality and performance measurement into management. Her experience includes positions at CBS Radio (Chicago Bears Radio Network), Comcast SportsNet, Intersport and with Northwestern University Athletics focusing on sports marketing and sports management. An advocate and enthusiast for non-traditional sports as well, she is a former director and coach for the Illinois Girls Lacrosse Association as well as an assistant director of operations for Chicago Youth Lacrosse. She is passionate about increased health, self-esteem, academic performance, responsible social behaviors and leadership skills for youth, especially girls. Brittany has a Bachelor of Arts in Communications from Howard University where she played lacrosse and a Master of Arts in Sports Administration from Northwestern University. Alex Moyer, Founder, Lead Curator- Northwestern University Alumnus ’85; National Football League Alumnus ’85-87; Moyer enjoyed a three-year stint with The Miami Dolphins and San Francisco 49’ers before pursuing a career in Real Estate Development and Finance. Since 1989 Alex has developed single and multi-family housing across the state of FL. Moyer has specialized in foreclosure and bankruptcy workouts and has provided non-conforming financing for investors and developers nationally. He is co-founder of Collegiate Athlete Gamechangers Inc.
Rudy Germany, Northwestern ’86 graduate in Radio, TV, Film/Speech and MA in Secondary Education from the University of Phoenix in 2005. Rudy spent the late 1990’s and all of the 2000’s working in the entertainment sector producing content for television, film and live music events in Los Angeles, New York, Dallas, Atlanta, Miami, Puerto Rico and Mexico. Over the last 10 years, Rudy has worked with numerous corporate and nonprofit entities as a Marketing Brand Manager specializing in Strategy, Planning, Asset Creation & Branding Integration adding technological advancement into client websites, communication vehicles, social media and live event platforms. For the last 20 years, Rudy has been a mentor and youth sports coach in several cities across the country, primarily because of his experience and understanding of the student athlete/collegiate athlete landscape, having participated in youth sports, high school athletics and being a collegiate athlete at Northwestern University. As a four-year varsity Letterman in the Big 10 Conference from 1982-1986, the same academic, social and societal pressures that face today’s collegiate athletes challenged Rudy. He is enthusiastic about the opportunity CAG has to make a difference through its programs. Carmen Ramos-Watson has over 25 years of experience as an entrepreneur and CEO of a management consulting firm that addresses social marketing, strategy development, and change leadership in the U.S. and within Latin American, US Hispanic and multicultural markets. She is a seasoned professional and social entrepreneur with expertise in nonprofit, public and corporate strategy with a consistent history of working beyond traditional strategies to leverage networks, partnerships and cultural assets for social change. Carmen is a 2015 graduate from Teachers College Columbia University in Organizational Psychology and Change Leadership and graduate of Harvard University’s Kennedy School of Government Executive Leadership Program. She is an experienced educator, presenter, facilitator and coach with special areas of focus in the health and education sectors. An activist in local and national health and education issues, she has created national health education campaign to address health disparities with services exceeding $5 million dollars in underserved communities. She has served as Chair of CentroNia, a bilingual multicultural learning center in Washington, DC, the Board of Directors for City First Bank of DC and a Fellow of the National Hispana Leadership Institute. Rosa Serratore, born and educated in Canada, is the PreK-12 mathematics coordinator for Santa Monica-Malibu Unified School District. Prior to that, she taught mathematics and French in SMMUSD, Long Beach CA, and Toronto, Canada. Rosa was selected by the California Department of Education to participate in the writing of the mathematics framework using the new state standards and served as a content reviewer for NAEP, our grades 4-8-12 national report card. She currently serves on the executive board of the CA Mathematics Council. In collaboration with Santa Monica’s Community College, SMC, Rosa developed and oversees the SMMUSD’s Young Collegians program for underrepresented/first generation college goers as of summer of their sophomore year, now in its ninth year. She networks and further collaborates with area universities and community agencies to assist students’ transition into college. In all administrative roles, Rosa’s mission is to support excellence in mathematics achievement and to provide opportunities for all students to have their potential and dreams realized. CAG would like to acknowledge and recognize Kevin Brown, Todd Jenkins, Tracy Parsons, Rick Telander, Joey Resnick, Mike Adamle, Richard Buchanon, Dr. Jerry Argovitz, Pat McCoy and Casey Cummings for their tireless effort to help establish the foundation and create the grass-roots support needed when CAG was originally formed. 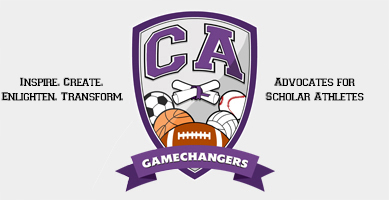 If it were not for the dedication and commitment of these individuals, CAG would not be in the position it is in today to inspire, enrich and impact the lives of middle school, high school and collegiate student athletes nationwide. As new organizations evolve and grow, those that survive typically do so because of the allegiance and devotion of a few and CAG is no different. Because of that, we are forever grateful to the gentleman listed above, as their engagement and belief in the vision of making a difference in the lives of student athletes has forged a pathway forward. Although the work they started will be carried on by new members, CAG will always be indebted to these gentlemen.